Join LatinoScoop at an exclusive advance screening of WIDOWS in select locations below. Register for a chance to win a pair of seats at the advance screening in your city. LatinoScoop will randomly select winners in each city. Winners will receive a pair of GUARANTEED seats (seats MUST be claimed at least 45 mins prior to the start of the film). Winners will be selected and notified via email on Friday, October 26, 2018. Names of winners will NOT be posted. To enter, send an email to screenings@LatinoScoop.com. When entering, submit your full name, phone number and email address. 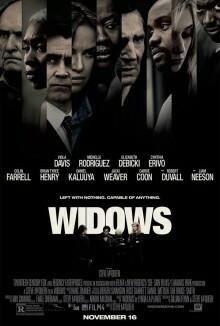 Enter WIDOWS & CITY in the subject line. Advance screenings will take place in the following cities below at 7:30PM.